As a state whose motto proclaims proudly — Eureka! — California’s bounty of advanced research institutions is decidedly appropriate. Alongside academic powerhouses such as the University of California campuses, Stanford, and Caltech, we also take pride in our unrivaled collection of federal laboratories and research centers. Discoveries by California’s federal labs and research centers save lives, advance technology, and inspire possibilities. They take us deep inside the genetic code, support the foundations of our energy and national security, and launch us toward the stars. Moreover, Federal scientists study issues directly affecting Californians, armed with one-of-a-kind supercomputers, lasers, particle accelerators, simulators, and engineering foundries only federally funded institutions can sustain. They are an integral part of California’s innovation, intellectual, and information landscape. As Californians confront big challenges — climate change, clean energy, cybersecurity, resource scarcity, and international competitiveness — these labs and centers stand ready to help. Let this portal be your guide to the federal research and expertise in the Golden State — and discover how our federal labs and research centers can help make California stronger with science. As this independent science advisory institution serving the State of California, CCST operates in partnership with, as well as receives financial and mission support, from a network of public and private higher-education institutions and federally funded laboratories and science centers. The California Council on Science and Technology (CCST) was established via Assembly Concurrent Resolution 162 in 1988. The resolution directed CCST “to respond to the Governor, the Legislature, and other entities on public policy issues related to science and technology” — and to create a council “comprised of distinguished scholars and experts, including scientists and engineers from California’s academic and industrial community.” Today, this Council includes many senior scientists from public and private research universities and federal labs serving the Golden State. 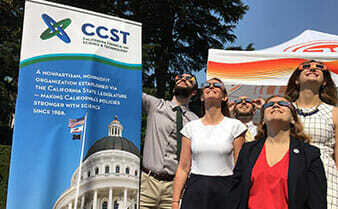 CCST has grown as a resource to connect decision makers with leading scientists in California and beyond. Over these 30 years, state leaders have requested CCST reports on many issues of policy importance, from natural gas storage safety to sustainable water futures. Why tap into federal science? Uniquely Positioned: Federal departments such as DOE and NASA are uniquely positioned to contribute to California’s scientific conversation. They leverage the might of federally directed research resources and facilities — bringing mission-oriented research and scientific facilities that complement the wealth of expertise at University of California, California State University, Caltech, Stanford, and other campuses. Trusted Research Partners: Federal research includes many focal areas that can directly inform policy questions at the state level. Federal labs can partner with state agencies and campuses to conduct studies vital for our understanding of natural and physical processes. These federal-state-university partnerships require time for planning and implementation, but they yield collaborations and important knowledge for lifetimes. Service to Decision Makers: Each federal entity boasts a government relations team able to assist local, state, and federal offices. 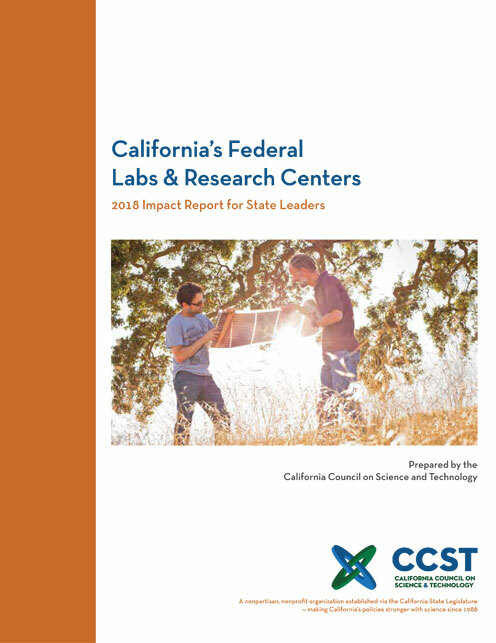 Together with CCST, these liaisons serve as a resource for community members and officials who want to learn more about federal labs and their broader impact for California. CCST can help Members and Capitol staff navigate the tremendous resources spread across federal labs and science centers in California. 1. Underground Natural Gas Safety (2018): State leaders tasked CCST with providing an independent assessment of the long-term viability of underground natural gas storage in California. The report effort was led by experts from the Lawrence Berkeley National Laboratory and the Lawrence Livermore National Laboratory. 2. Biomethane Heating Values (2018): At the request of the State, CCST completed a study analyzing minimum heating value and maximum siloxane concentration of biomethane injected into natural gas pipelines. Scientists from Sandia California participated in the study process. 3. Hydraulic Fracturing (2015): CCST and the Lawrence Berkeley National Laboratory partnered to author “An Independent Scientific Assessment of Well Stimulation in California,” a three-volume report responding to SB 4 (2013). When should I contact CCST? During policy development, to obtain data and advice from subject area experts. During the legislative process, to find experts for testimony at policy, fiscal, select committee, and other hearings. During implementation and regulatory enforcement, accessing current science to review standards, technologies, efficacy, and relevance. When recovering from and analyzing natural disasters and human-engineered catastrophes. If your office is considering legislation that you believe would benefit from federal expertise, or if you are seeking data and advice to strengthen your decisions with science, contact CCST — and we will help you navigate the bounty of top scientific minds available to California. CCST can assist California Legislative and Executive offices in navigating federal research resources in the State of California.